1. Know the difference between Veterans Day and Memorial Day. 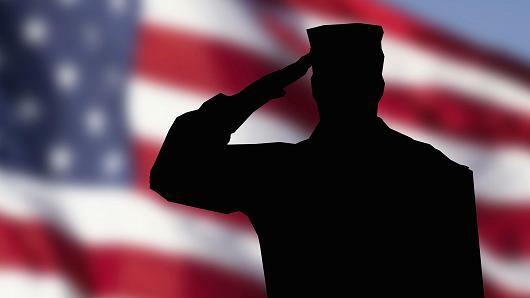 Veterans Days is November 11 and designated as a day to honor all who have served in the military. Memorial Day is celebrated the last Monday in May, and pays tribute to those who died serving in the military. However, any day is a good day to say Thank You – amirite? 2. Ask your favorite She-Roes and Heroes about their service and favorite initiatives. Meet a few of mine here! Lara also has a son in active duty – we are grateful for his service! She is a busy mom, travel blogger and social good advocate. Lara is a fierce champion for many Veteran initiatives and shares some of her favorites with us. She is a strong supporter of Operation Delta Dog an organization that rescues homeless dogs and trains them to assist Veterans suffering from PTSD and Traumatic Brain Injury. WINC (Women Injured in Combat) – this organization helps women Veterans by providing meet-ups, retreats, scholarships, peer support groups, resources and more. The Bob Woodruff Foundation which finds partnerships to fund and shape programs to meet the emerging and long-term needs of Veterans and their families. The Bob Woodruff Foundation also gives 80 cents of each dollar to Veterans (that’s roughly 8 times the average according to Lara). And I would be remiss if I didn’t mention Judy Davis an expert on Military Life who leads a huge community of active Duty Military Spouses. We celebrate you every day! 4. Learn the Pledge of Allegiance, The Star Spangled Banner, America the Beautiful or the Armed Forces Medley so you can join in at the next event. They’ll be pretty impressed! 5. Research easy ways you can help Veterans all year long. 6. Support brands that support our troops and Veterans. Like my favorite > Verizon! More than 10,000 employed who self-identify as Veterans. Verizon also made the 2017 Military Friendly Company List! Discounts and savings for Veterans and Active Military to keep them connected to friends and family no matter where they are! THANK YOU to ALL Veterans and active Military personnel for your service and sacrifice. We appreciate and honor you! Posted in Social Media , GOOD DEEDS, Living and Lifestyle and tagged with Veterans Day, Social Media, Charities, verizon, Celebrations. November 11, 2017 by Lin C.
I’m sharing about E-Gifting as part of my mobile life in participation with the Verizon Wireless #VZWBuzz Influencer program. Giving is good. Science says so. Actually, some scientific studies say that giving makes us happy. Some even believe that altruistic behavior releases endorphin in the brain giving us what they refer to as “helper’s high”. Good news, right? But what if we’re stuck in a long line, in a hot store, behind someone who is buying an entire clearance rack of crap with coupons! So much for your helper’s high! Cue the E-Gift. What is an E Gift? E-Gifts are used just like regular Gift Cards online or in stores but sent and received digitally via your mobile or email ORRRR it can be a service or product that is purchased, transmitted, delivered, received and used via mobile. What’s great about E-Gifting is everything! It’s instantaneous, it’s accessible any and everywhere and it’s virtually impossible to lose. Unlike a gift card that you lose immediately after receiving it. Can I get a witness? There are so many great options to choose from, even from your mobile device. Here’s my short list on how to shop smart with E-Gifting and avoid going to jail the night before Christmas. PayPal – it’s fast, it’s easy and there are gazillion choices. You can send it instantly or you can buy ahead and pick a date. I like it. iTunes – I don’t know if all the Apple Fangirls and Fanboys know you can E-Gift from iTunes. Maybe I’m just late to this party. Either way, Muy Bueno. And you can do it right from your mobile device! Buy from iBooks Store, and App Store, you can gift dollar amounts, books, audiobooks, music, movies, TV shows, or apps. I love it. Digital Magazine Subscriptions – magazines have always been my favorite stocking stuffer but magazines are big and bulky and need to be recycled. So go digital instead! There are magazine apps like Texture, Zinio and countless others. But sometimes “I” prefer to go right to the source. What a great gift. I like it. Verizon Messages E-Gifting - for Verizon customers, directly from your messages app it’s unbelievably easy to use. Choose from over 30 popular retailers, including AMC (love the gift of movies) and YOU choose the denomination. Yaaass! Right from your mobile device. I love it. Data – go on, give a gig! Who can’t use data! And with my preferred carrier Verizon, you can give a gig of data for only $10 bucks! Data hogs rejoice! I love it. IFTTT – if you really messed up and didn’t get anything out because you were under a rock somewhere. At least you can use this IFTTT recipe to preschedule a Happy New Year greeting to everyone who may or may not be speaking to you by then. Did I miss any? Sharing is caring! Posted in Tech, Living and Lifestyle and tagged with Christmas, Holiday, Holidays, E-Gift, Shopping, Christmas Shopping, Verizon, Verizon Wireless, Data, Mobile, #VZWbuzz. December 6, 2015 by Lin C.
Sometimes I have the most rapid-fire random thoughts, it’s hard to keep up. And sometimes I take it to another level and investigate them. I’m certain this isn’t normal. This day my husband and I were in the kitchen doing I don’t even know what, and he began to whistle. It made me smile but it also gave me pause. As usual, my brain went into overload. You’re whistling. Why do people whistle? Why are YOU whistling? Is whistling a decision? Does your brain say okay, let’s whistle now? Like, what’s the process? I mean the dwarfs whistled while they worked but there was only ONE happy one. So is whistling good or bad? *faint*. So I decided to check this out (you know, because I don’t have five MILLION other things I need to be doing). Turns out here isn’t much information out there about whistling! I managed to scrape up five interesting tidbits. 1. Whistling distracts and calms the brain. 3. Whistling is a habit. Some people don’t even realize they’re doing it. 5. Men whistle far more than women. Posted in Living and Lifestyle and tagged with whistling, whistling convention, how to whistle, best whistling songs. November 23, 2014 by Lin C.
Picking up from my post about Yankee Candle and my customer experience. I wanted to share what I learned. I have been burning candles since dinosaurs were wandering the earth. I just like ‘em. But can I tell you- I have evidently been doing it wrong this WHOLLLLLLLLLLLLLLLLLLLE time! Five ways to LOVE a candle (courtesy of Yankee Candle). I have never done that. There I said it. You need to trim the wick to 1/8” and keep it like that the whole time. So you may (or not) be thinking, what I was thinking. How the heck am I supposed to do that! There’s not an app for that but there IS a wick trimmer! Who knew! Each time you burn your candle, let the top liquefy to get the most of your scent. I was skeptical but it’s true! Yep. WHAT! It won't last a week! No momma. Let it burn the first time 4-5 hours. WARNING: NEVER leave a candle unattended. Meaning don’t take off and leave a burning candle in your house. And for the love of all things holy – keep it AWAY from children. DUH! Okayyy?? I have probably seen it before but I thought it was a decorative thing. I had no idea it performed a function. A topper reduces the effects of draft and extends the life of your candle. Whaaa? Excuse me? Yes. If you use your wick trimmer and push the wick into the liquid, the flame dies out without the whole “what’s that smell?” “Did you just blow out the candle” dilemma. P.S. I’m in love with Black Coconut right now! Anything else I should know? Tell me about it! Posted in Customer Experience, Living and Lifestyle, How To and tagged with Candles, Candle Trimming, Candle Burning, Candle Toppers, How To, Yankee, Yankee Candle. November 1, 2014 by Lin C.